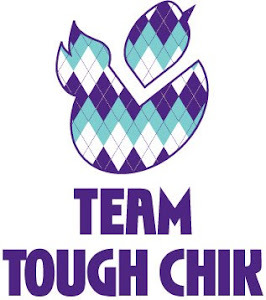 This week's Team Tough Chik blog is 'your best/worst race'. Most of my races have been amazing. I think my only bad experience was 2010 Baltimore Half Marathon. I should start out by saying my training for this race was questionable. It consisted of me doing nothing during the week then going for a long run on the weekends. I increased my long run mileage each weekend without running during the week. Clearly this is a recipe for disaster. Of course I was hurt as I walked up to the starting line. The whole right side of my body was tight and messed up. I should back up. Before I get to the starting line. Pnut really wanted to be a part of the race, so Brian agreed to take her to do the Kids Fun Run. I'm not sure anything about it was fun. I had to go to the start before she ran. She was crying when I left. Turns out she walked most of it, in tears, holding on to Brian. In her defense, there were SOOOO many people there and when you are 3 feet tall, that has to be scary. So, Brian took care of the Fun Run and was left to entertain Pnut while I ran. Not an easy task. He was pretty happy when I hobbled up to him (almost 2 and a half hours later) after the race. I started faster than I should have. I am so pumped up on adrenaline at the start of races, it's hard to hold back. This didn't last too long. About 3 miles in I was in a lot of pain. Later, Brian asked why I didn't stop. I honestly thought about it but I didn't know how I would get back to the car. I walked a lot. I almost cried. Not because of the pain, but because it was such a miserable experience. I crossed the finish line and found Brian and Pnut. Brian was grumpy. I was hurt and grumpy. Pnut had made a friend and she was crazy hyper and didn't want to leave. A perfect end to a horrible race. There were a couple of good things about this race. First, I ended up with my sisters bib (and timing chip) and she had mine. She ran about 25 minutes faster :) Second, my friends Karen and Enrique had an awesome party that night. We sat outside eating awesome food and drinking fabulous wine. Do not start a race if you are so unprepared you will end up getting hurt. I love, "If it possible get a faster person's timing chip." Classic! Love it, especially the faster persons timing chip. I am a slow and steady runner and will never break any records. Good advice on not taking the kids. I haven't done a long race yet, but I am sure my husband would be miserable waiting for me with two little one.